The benefits of teeth straightening range from a boost in confidence to healthier teeth and gums. 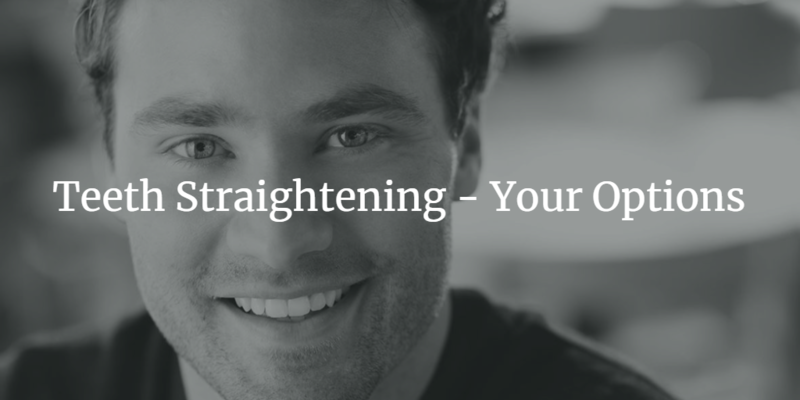 In this article, we highlight the best treatment options for straightening your teeth at Bright & White so you can get the smile you’ve always wanted. Straighten your teeth faster than ever with Fastbraces. Fastbraces is a speedy treatment and can straighten your teeth in as little as 3-10 months, which is faster than standard braces. This treatment is very effective for those with crowding, underbites, overbites, misalignments, crookedness, and spacing, and the extraction of teeth is not necessary, as is common with a regular brace. Fastbraces offers a comfortable and safe teeth straightening solution. With adjustments every 5 weeks, it is an easy and smooth straightening process and is less painful than standard braces with minimal discomfort. Fastbraces is a more affordable teeth straightening option than standard braces. With the treatment ranging between £1800 and £3500, it is a cost-effective solution that provides priceless results. Six Month Smiles straightens teeth using a clear brace with small tooth-coloured nickel-titanium wires for maximum discretion that gently and gradually moves the teeth for minimal discomfort. As the name suggests, this treatment option takes around 6 months to complete, with most patients typically gaining straight teeth between just 4 and 9 months as the teeth are moved securely at a fast speed. This option is much more cost-effective and affordable than traditional braces and aligners used to straighten teeth, and the cost of the treatment will depend on your individual treatment plan. This treatment uses proven techniques and materials to straighten crooked, spaced, or misaligned teeth. Six Month Smiles is an effective treatment and moves teeth into place easily, safely, and comfortably. Invisalign is a nearly invisible way to straighten teeth without metal braces. This treatment option uses discrete clear, near-invisible, removable custom-made aligners to move the teeth little by little efficiently, gently, and accurately. This treatment is ideal for those with overcrowding, gaps in between teeth, crossbite, overbite, and underbite. The treatment will take 6-12 months and cost between £2000 and £3500 depending on each patient’s individual personalised plan. You will simply need to visit your dentist every 6-8 weeks to change the aligners every 2 weeks as your teeth move. The aligners are comfortable as they are custom-made to your teeth to fit your gum line. This makes them less painful than a traditional metal brace as there are no wires or bands to abrade and irritate your mouth. You will wear the aligners day and night and will be easily removed before eating, drinking, brushing and flossing so there are no food restrictions and you can maintain optimum dental hygiene. This means you can carry on with your life as normal as long as you wear your aligner for the recommended 22 hours a day. Bright & White Dental Spa offer Fastbraces, Six Month Smiles, and Invisalign with 0% interest-free financing, complimentary teeth whitening, affordable price plans, and free retainer. Book a consultation with our dentists today and we will find the right treatment solution for you so that you can achieve the smile you’ve always wanted.